illion will perform in “Strawberry Music Festival 2018”!! Pleased to announce that illion will be at “Strawberry Music Festival 2018” which will be held in Beijing and Shanghai from April 29th 2018 to May 1st 2018. The music video for “BANKA” which is in the new album ‘P.Y.L [Deluxe Edition]’ is now on youtube. Brand new song “BANKA”, the theme song of the movie “Tokyo Ghoul” is now digitally released. Check out the special video of the brand new song “BANKA” on youtube. Details of “P.Y.L [Deluxe Edition]” has been released. Check the link for information. New trailer of the movie “Tokyo Ghoul” featuring the theme song “BANKA” written by illion reveals today. “BANKA” releases on July 21st worldwide !! illion is pleased to announce providing the theme song of live-action film “Tokyo Ghoul” which will be running from July 29th 2017. The song is called “BANKA” and it is originally written for the film. Details will be coming up shortly. The music video for 'Miracle' which is in the new album 'P.Y.L' is now on youtube. Just uploaded a video, “Hilight feat.5lack”. The trailer of music video for 'Miracle' which is in the new album 'P.Y.L' is now on youtube.The music video will coming up soon! Just uploaded a video, Told U So. SSTV / Station ID 90 seconds. *You need VR goggles in order to enjoy VR. New single “Told U So” is out now on iTunes Store ! Just uploaded live video,85 at STUDIO COAST, Tokyo 2016. Just uploaded live video,PLANETARIAN at STUDIO COAST, Tokyo 2016. New single “Hilight feat.5lack” is out now on iTunes Store. Just uploaded live video,Hilight feat.5lack (Short Ver.) at STUDIO COAST, Tokyo 2016. Details of the new album has been released. Just uploaded music video, “Water lily”. ○illion will be on the cover of 'ぴあMUSIC COMPLEX Vol.5 (PIA MUSIC COMPLEX Vol.5)' and feature article will also be included (Release date: Aug. 23th). The article is asking for comments and answering questionnaire. Check out the link for more details. *Please note that the links below only have Japanese website. ○illion interview article is on the website 'CINRA'. *Please note that the link below only has Japanese website. 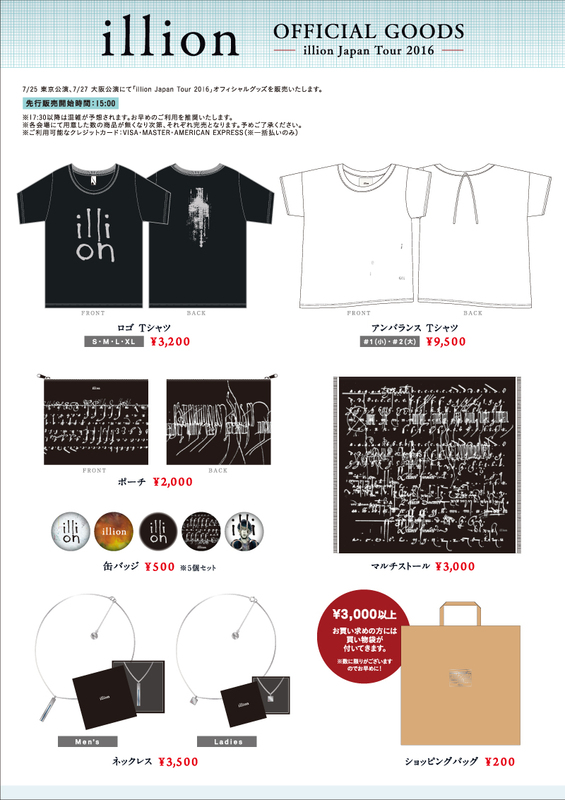 In response to numerous requests,merchandise of 'illion Japan Tour 2016' will be available from a mail order. Excited to announce that PUNPEE(DJ) will be on the stage of 'illion Japan Tour 2016' in a row! He will join not only in Tokyo(SHINKIBA STUDIO COAST) but also in Osaka(Zepp Namba)! illion's brand new album will be coming up on Oct. 12th. Excited to announce that Ikuko Harada (clammbon) and 5lack will join illion's show on Fuji Rock Festival’16. Ikuko Harada participated in new single "Water lily" and 5lack also joined in the different song which will be recorded in the upcoming album. 5lack will join the shows in Tokyo and Osaka as well! 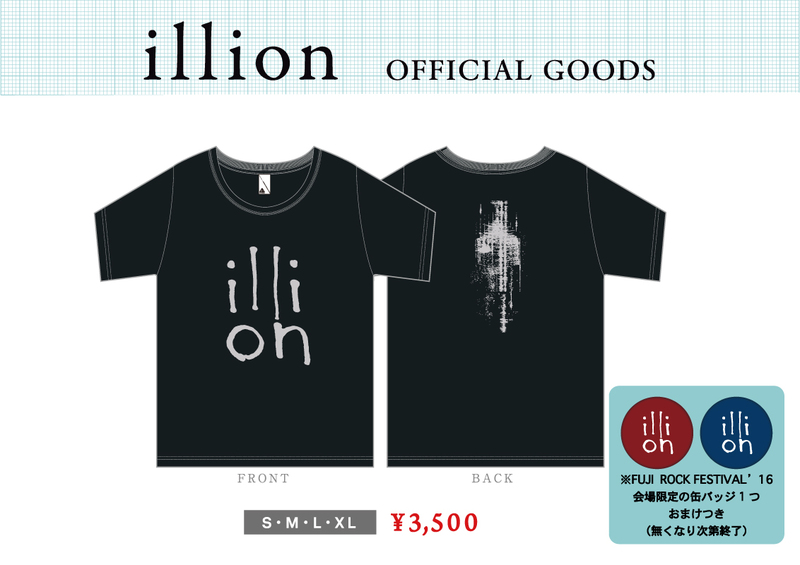 「illion Japan Tour 2016」merchandise will be available at the Tokyo and Osaka performance. Get the T-shirts and get an exclusive badge for free. illion is exicted announce that PUNPEE（DJ） will perform as a Guest Act in 'illion Japan Tour 2016'. Please refer the LIVE page for more details. As the song production has been going quite fantastic, illion would like to announce that next release will be a full album instead of EP. Album is planning to release in autumn and the specific date will be announced shortly. Prior to this release, few of new songs are planning to be distributed in summer. illion apologize for those who were waiting the EP, but it will be appreciated if you look forward to this new album. Also, illion would like to add that there will be no cancelation on the shows and the live will be held as per schedule. illion appears on FUJI ROCK FESTIVAL’16!! For details, see LIVE page. illion announce “illion Japan Tour 2016”!! We will start the earliest Advanced Reservation of ticket. 1st Album "UBU" was released on 24 September 2013 in Taiwan. Just uploaded live video, "GASSHOW" at O2 Shepherd's Bush Empire on 17 March 2013. Debut Album "UBU" is available on iTunes in 111 countries!! Just uploaded live video, "BEEHIVE" at O2 Shepherd's Bush Empire on 17 March 2013. Just uploaded live video, "MAHOROBA" at O2 Shepherd's Bush Empire on 17 March 2013. UK website, Never Enough Notes is introducing a live video "γ (Gamma)" . Just uploaded live video, "γ (Gamma)" at O2 Shepherd's Bush Empire on 17 March 2013. Just uploaded live videos, "LYNCH" "BRAIN DRAIN" at O2 Shepherd's Bush Empire on 17 March 2013. Another live videos will be uploaded fifth times in a row on every Friday, including this time. Vinyl LP "UBU" will be released in early July in UK, Germany and Japan. Dates and detail are listed on DISCOGRAPHY page. Please check out illion's "BRAIN DRAIN" from the O2 Shepherd's Bush Empire show at THE LINE OF BEST FIT. Just uploaded music video, “BEEHIVE”. illion’s official twitter account is now available. illion "BRAIN DRAIN" UK premiere now live at Clash. Just uploaded music video, “MAHOROBA”. New Album "UBU" released on February 25 in UK will be in also Japan, Germany, and France. Dates and detail are listed on DISCOGRAPHY page.